Taste test: These are regular potato chips with a mild onion and garlic flavor  mild enough that when it comes to the key question of whether the garlic or the onion is stronger, I'm really not sure. 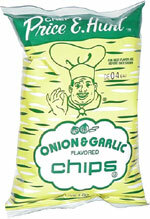 They're good, and there's nothing really wrong with them, but I've eaten lots of tastier onion and garlic chips. Smell test: Very slight onion aroma. From the package: “Say NO! to drugs” ... Ingredients include Monosodium Glutamate and Hydrolized Vegetable Protein. 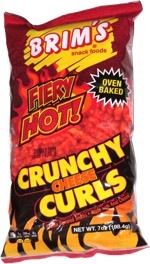 This snack was discovered by Jeremy in Somerville, Massachusetts. Review published .